I've been living in dresses this summer. I basically decided that I'm not really a fan of shorts, so why bother? When I decide I love something, I usually end up buying a million and then getting tired of it in about 5 seconds. BUT, with dresses, there are so many different styles and I haven't gotten bored yet. Today I thought I would share a few of my favorite styles to give you some inspiration for the rest of the summer. And the best part? Each dress in this guide is under $50! 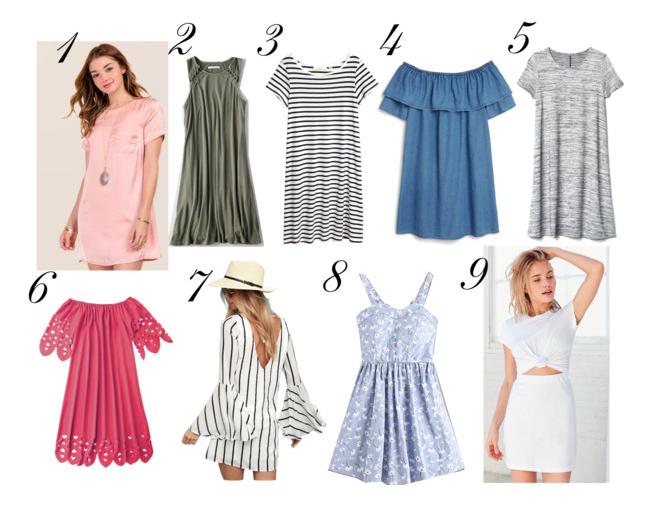 I hope you guys all enjoyed this guide and that it gives you some gorgeous inspiration for dresses for the rest of your summer! As always, let me know if you guys have any questions of other suggestions, I'm always happy to get new dresses! (Even though my wallet is not).